Although the United States is facing an economic crunch, some parents are lining department stores to fulfill holiday wish lists. On that list may be the latest Air Jordans while globally there are millions of children desiring only a pair of shoes. According to statistics from the World Bank Group, every year Americans spend $256.0 billion on clothing and $50.7 billion on shoes. Around the world there are over 300 million children walking around shoeless. Every year over one million of those children die from preventable diseases caused by the lack of proper shoes. “The lack of shoes around the world is a serious crisis,” says Hajah Young-Sall, founder of the Atlanta-based organization YES, Inc. The mission of YES, Inc is to improve the quality of life for African people by providing them with basic human necessities such as shoes. Mrs. Young-Sall was inspired to serve the shoeless population over twenty years ago after a family trip to Senegal, West Africa in the late 80’s. “I was saddened by the living conditions in Senegal. In particular the enormous amount of men, women and children walking around barefoot,” Mrs. Young-Sall told The Final Call. According to the website of YES, Inc., shoes are a rarity for people in the impoverished parts of Africa, Asia and South America to the point that some never have a new pair of shoes in their lives. Research by the Center for Disease Control and Prevention (CDC) shows that there are many hazards associated with going barefoot in contaminated soil, dirt water, and sand. One of the most deadly is hookworm disease that can lead to parasitic infections in barefoot individuals. Parasites also breed in stagnant water in which many children swim and even drink from when necessary. If left untreated, these parasites can result in internal poisons, the loss of limbs, chronic illness and even death. Thus, the group launched the “Shoes for Africa” humanitarian project to collect new and gently-used shoes. Over the last five years alone, YES has collected and distributed over 35,000 pairs of shoes to Senegal. Donations to the project have been received from supporters in North America and as far as New Zealand. The initiative has also sparked several schools to get involved and launch their own shoe drives. Patrick S. Muhammad, an assistant principal, has built momentum in the Dekalb County public school system with a goal to ship 5,000 pairs of shoes through YES, Inc. by February 2010. “The number of shoeless children in the world is a serious crisis. Children without shoes in Africa are even hindered from going to school due to diseases. I wanted to get our youth in America involved,” Mr. Muhammad told The Final Call. 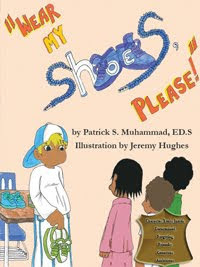 Before partnering with YES, Inc., Mr. Muhammad had authored the children’s book “Wear my shoes, please”. The book chronicles three illustrated African refugees who came to America sharing only one pair of shoes between them before eventually receiving a donation from a bully turned friend. The book is being used as a teaching tool in elementary schools in Illinois, Kentucky, Texas, New York, and Georgia. To date, Mr. Muhammad’s network of schools has collected over 2,000 shoes. One of the schools utilizing the book and participating in the shoe drive is The Elevated Places located in Missouri City, Texas, right outside Houston. “I truly wanted the students to take part in this project to expand their perception of community service. Our job is to prepare our children for service on a global scale,” says Wakiti Muhammad, co-director of The Elevated Places. The school has collected over 200 pairs so far. “We Americans can be very materialistic. We have an immense amount of everything because we overindulge in ourselves and don't think about our community,” says Aishah Muhammad, 8th grader. What a noble deed. Black youth ARE doing positive things...and they should be commended. Big props to the Elevated Places for connecting our youth internationally. All praise is due to Allah. As a mother, it is beautiful to see young children perform a selfless act in a selfish world. Great thanks go out to Sis. Wakiti and The Elevated Places staff! Thank you sooo much for sharing this wonderful and much needed initiative! I know that it is by design that we do not see or hear about the needs of our brothers and sisters abroad, even if it is as basic as a pair of shoes! Thank you for keeping us informed so that we can take action! Thank you, Elevated Places, for leading by example here in Houston!!! !